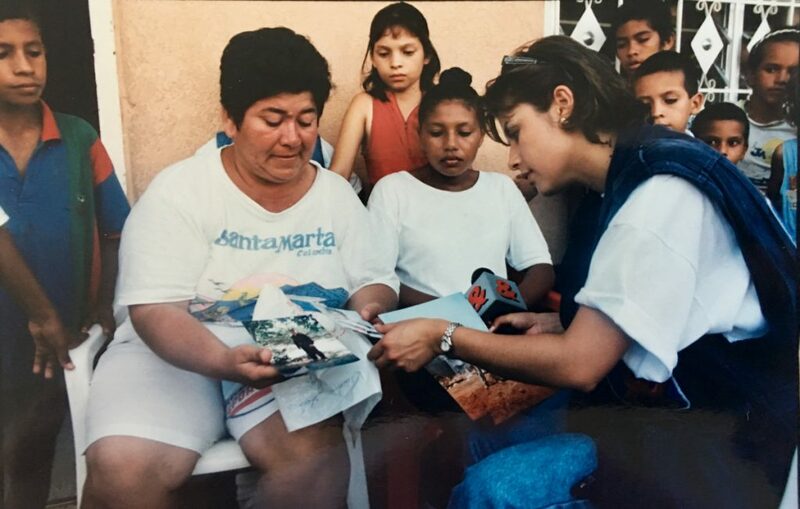 Journalist and author Adriana Aristizábal is a, best-selling author and former war reporter. 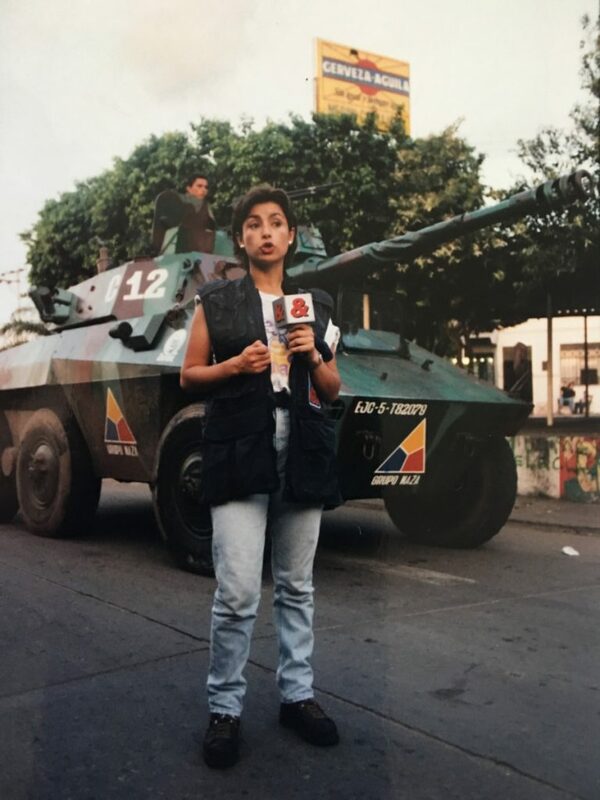 In the late 90’s she covered the war in Colombia live from the frontlines. Adriana worked for RCN, CM and HORA CERO, popular news networks throughout Latin America. In 2003 she published the best-selling book La Guaca de las FARC (‘FARC’s Stash: I Found It’) published by Quintero Editores. The book tells the true story about a group of soldiers who stumbled upon millions of dollars stashed in underground barrels by a notorious terrorist group. They run away with the treasure and get away with it. 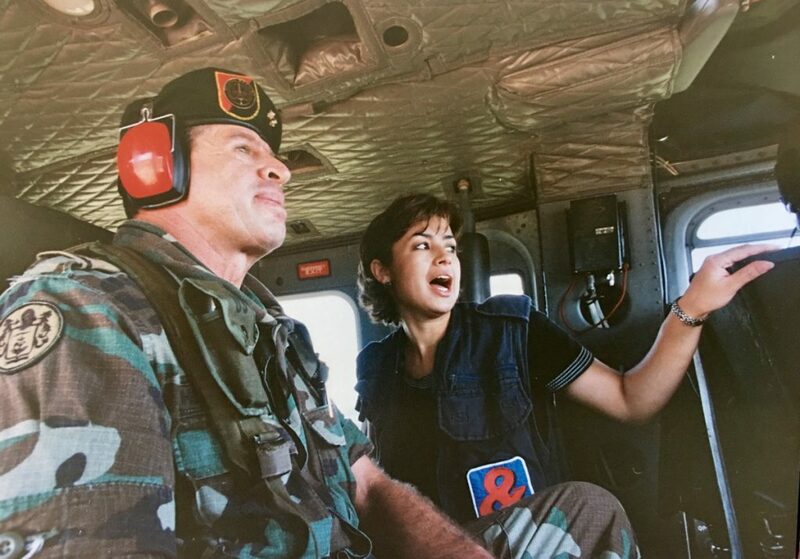 In 2003, the Congress of Colombia honored Adriana with a proclamation recognising her accomplishments as a war reporter. 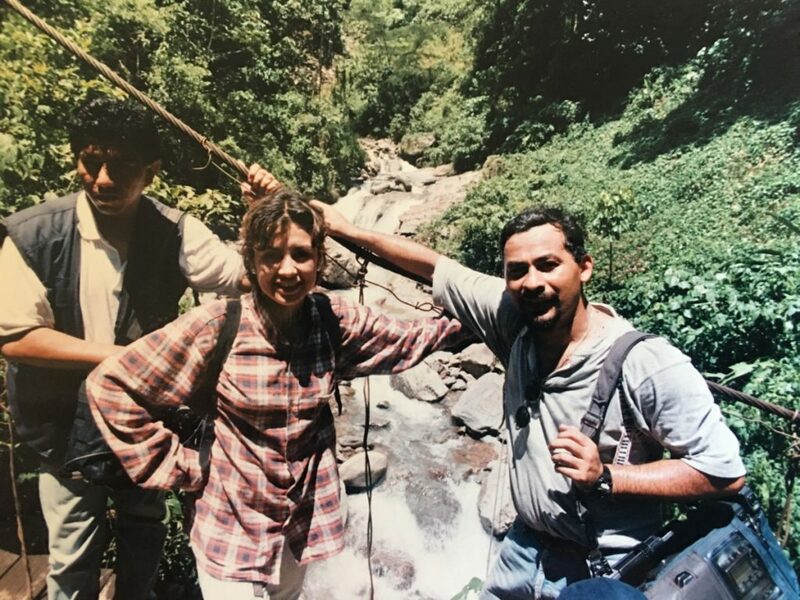 In 2004, Adriana received death threats from the toughest FARC leaders. She fled after securing a new opportunity to work for the Colombian Consulate in New York City. In 2010, the Council of New York honored her for her support in the field of Arts and Culture. In 2014, El Diario La Prensa in New York awarded her as part of their “Outstanding Women” program. Currently, Adriana is a contributor to The Huffington Post and Thrive Global and is Anchor at NY1 Noticias. Adriana has been a speaker at top universities in the United States. On May 20th she will be speaking about Courage and Resilience to the 50 Fortune Most Powerful Latinas at Columbia University. What got you started covering conflict? 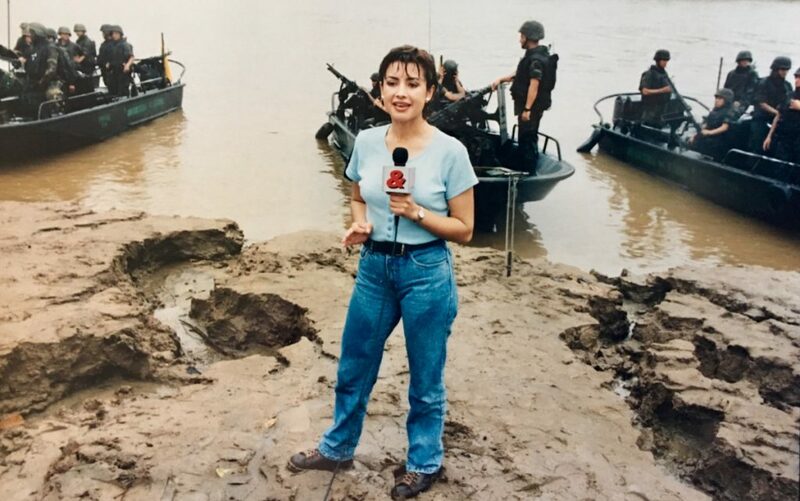 I was 26 years old and a single mother when I got my first assignment in the newscast as a war reporter. They hired me specifically to do that job. I knew that was a challenging task, especially because I have to sacrifice time with my son. But I did my best being mother and father and I focused on making my job well done. How did you prepare for your work on the front lines? In my 7 years of experience covering the war in Colombia, I never had a bulletproof vest or a helmet. In the beginning of my career, we were never told about how to deal with our security in the field. Back in that time, we felt safe exhibiting our newscast ID cards, or a white flag as a symbol of peace when we were entering in a conflict zone. Did you have any safety training? Yes, In 2000 I had training with Centurion Risk in Washington. I had the opportunity to meet a very impressive group of war reporters from Reuters. Some of them covered the war in Rwanda, Bosnia and Afghanistan. Colombia’s big picture isn’t easy, even in hindsight. How did you manage to condense the very complicated issues into the short, easily digestible format of TV news? I was always searching for exclusive news. Some of my sources were dangerous people and the information they provided had to be verified with different sources. It was very complicated to condense the amount of information, so our team split up to cover every angle of the war. In that case, we had journalists focused on drug cartels, guerrilla, paramilitaries, police and army. But as many of my colleagues, I found myself sometimes caught in the storm of war, because we have to walk in a precarious silver line dealing with all the parts of the conflict. What are the benefits of live news coverage? The disadvantages? I think live coverage has more advantages than disadvantages, from my point of view the benefit is that people can get the information instantly. Now the challenge is to compete with the new technologies where anyone with a smartphone can become a reporter. A good example of that was the Arab Spring, the world knew instantly through Twitter and Facebook the events that follow the revolution in countries where the media was banned. Back there, citizens became journalist making live coverage thanks to the new technologies. A misconception about TV reporters on the frontline is…. That we leave the humanity somewhere behind when we are going to cover the war…and I don’t agree with that misconception because there is humanity when we cover the stories of the victims; the people that suffer the most in the horror of the war. What advice do you have for young reporters interested in covering conflict? Follow your heart and do your job with passion and integrity. In 2004, you fled Colombia due to death threats from FARC. With peace talks underway, is it safe to go home? During the last 13 years, my country has been experiencing many changes. First, a peace process with the paramilitaries and the demobilization of 30,000 fighters, and now the peace process with the FARC that is allowing Colombia to position itself as a country of hope and progress. The case of Colombia should be taken as an example that no matter how violent and bloody the history of war is, peace should always be a possibility. Peace talks are ongoing in Colombia in part due to journalists who refused to let people forget about the issue. Is it possible to see a similar result in Syria? The modern history of the world should be written by journalists who are first-hand witnesses of the events. In that way, the truth will never be forgotten and the next generations will know the truth about what happened, not to perpetuate vengeance and hate, but to help them in the search of Resilience and Forgiveness. Your book, Caught in the Storm of War, has just come out. What do you hope people will come away with after reading it? My message is about Resilience and Courage. We, as individuals should be focused in the search of our essence, we should be thinking what we are going to do and how we are going to react to the next aggression. Are we going to perpetuate the eye for an eye? Or are we going to try to bring out the best of ourselves to build a better society? I have with me 40 notebooks from my experience as a war reporter in Colombia. In my recent book, I shared 20 stories, but I have many more to share.